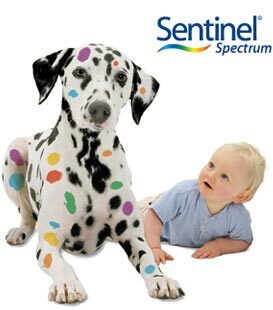 Buy Sentinel Spectrum for dogs online! Sentinel for dogs is the only product on the pet market that treats for fleas, heartworm and all of the intestinal worms. Sentinel will treat your dog for flea allergy dermatitis, prevent & control fleas long-term, heartworm, hookworm, roundworm, whipworm and tapeworm. Sentinel spectrum is a chewable tablet that last for 1 month and is 100% water resistant. Sentinel can be used on puppies from six weeks of age. Purchase Sentinel Spectrum for dogs flea & heartworm treatment online at the best and cheapest price. Provides long term protection and control of flea infestations. Easy to take tasty chewable tablet (give with a full meal). Does not kill adult fleas, if your dog already has fleas, you should treat with Capstar or another product that kills adult fleas first. We sell Australian Sentinel Spectrum with packets marked as Sentinel Spectrum for dogs in kgs. For more information see Sentinel Frequently Asked Questions.